It’s that time of year again! It is back-to-school season when many a harried parent is running around looking for the latest backpack, glitter pens, and stickers. Though kids hate returning back to school, you hate having to fight to the (near) death over the last 5-subject notebook. It doesn’t have to be this way. Here’s project management to the rescue! 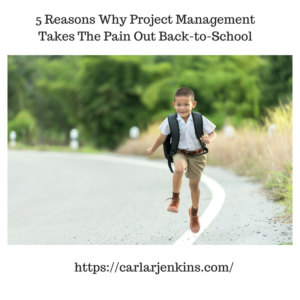 Here are my 5 reasons why project management will make back-to-school easier! Time management – Does your school drop-off and pick-up resemble one of those NASCAR pit stops? Hey, all the more reason to apply time management to your back-to-school routine to get a victory lap in less than 7 seconds! Resource management – Those sandwiches, lunch boxes and Thermos aren’t going to fill themselves! Here comes resource management to the rescue! Resource management lets you optimize your people and resources towards making back-to-school a much smoother transition. Resource calendars contain people’s vacation schedules, days off and availabilities are great to know who can carpool, drop off at soccer practice, etc. Cost management – Do you feel that you get poorer after the start of the school year? Thinking that buying all of those notebooks, folders, Crayola, compass, calculators have you filing chapter 7? Fear not because cost management will save you for the poor house! Scope management – It is hard to keep the main thing the main thing – and scope management does just that. It lets you stick to back-to-school ONLY. No homecoming, football game, last-minute Labor Day pick ups! Stick just to back-to-school. If you don’t color within the lines, you’d get a mess – and you could go broke doing it. Requirements management – There are a lot of moving parts to get this back-to-school operation off of the ground and running. In project management, you can trace requirements back to their source. Tracing makes sure that you don’t lose track of anything or anybody. When you are in the middle of Staples on the Friday before school starts (hey it happens to the best of us), you don’t want to forget anything on the list because you are busy clamoring for pens and pencils. 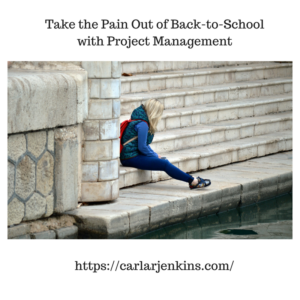 Applying project management (like Elmer’s glue to a school project) will take the pain out of back-to-school. Nice tips Carla. I am sure many a mom will find this post helpful. We will feature it for you on the next Blogger’s Pit Stop. Thanks for highlighting this article. I wrote it to help people deal with back to school.